Need help regarding setup of Thomas' shadow implementation in my example. Re: Need help regarding setup of Thomas' shadow implementation in my example. It's based on Thomas.' work but simplified to one ShadowHelper class (a little similar to what desktop jPCT already offers). That's not saying that Thomas.' source code is too complicated, but it has a much larger scope than this small example, so i decided to cut some stuff and modify some parts. Anyway, without his great work, i couldn't have done this in just 2 hours. I hope this helps somehow. 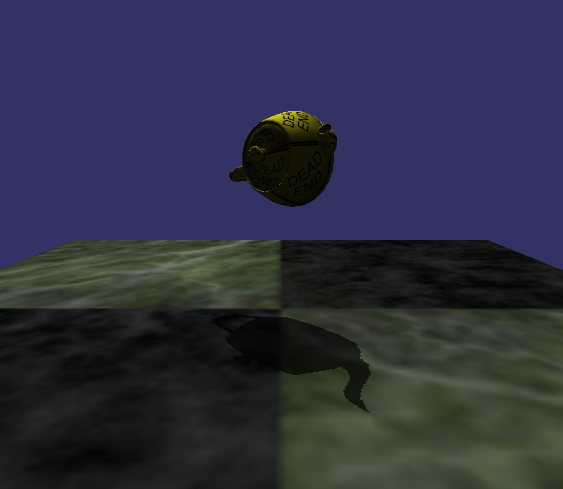 This example uses a single shader for all receiver objects. It's based on the most complex default shader that jPCT-AE offers. So performance might not be optimal in all cases. In addition, it assumes that the depthmap is in texture unit 1, which might not be the case for multitextured objects. Anyway. it's just an example to get you started. I hope it helps. Is it possible to have a dark color shadow with a transparent receiver? Could you please give me a hint how to do that in jpct-ae? Basically what I want to achieve is exactly the same with this post: http://www.jpct.net/forum2/index.php/topic,2626.msg19433.html. The only different thing is I'm using jpct-ae. Plus, the shadow is not mapped correctly. Probably because of my Projector, not so sure if I set all needed parameters correctly. Why is your projector inside of your object? Is that intentional? Apart from that, I'm not sure what the issue should be. I made myself a test case, set the transparency to 20 and the shadows looked just fine. Are you sure that your code uses the ShadowHelper from the jar and not the one from the zip? Sorry, it was a mistake. Just ignore that line. Works fine for me...do you have complete test case for me to try? Apart from the shadow color, why there's no shadow at all when I set the projector's position in the sun's position ( projector.setPosition(sun.getPosition) ) ? Isn't projection's position supposed to control the position of the shadow on the receiver? Just like what sun does with the ShadowHelper in your zip example? The far clipping plane should be large enough to be able to render the object from the light source. Cool, now it works. Thank you!